Luckily, it's not hard to avoid these blunders. This is a guest post by Bill Post. How can you make sure that your business card is the most effective tool that it can be? By avoiding these errors. Someone reading your card should immediately be able to tell what kind of work you do. If you are in a conservative industry, such as law or finance, you'll want a simple white business card with black ink, raised lettering, and very little, if any, color. If you are a graphic designer, though, you may want something more creative. If you have a personal logo on your resume, it should be on your business cards – everything should match. However, don't make the logo over-sized. Keep it understated, so that you have room for your contact information and don't need to print your phone number and address in print so tiny that your contact with need a magnifying glass to read it. Unless you are an actor or are trying to get a job as a network news anchor, or are in some other business where your face is part of what you are trying to sell. Otherwise, the photo just makes the card look schmaltzy. Don't add a gimmick to your card without a good reason. These days, everyone wants to stand out by producing a business card that is different and unique (like one that uses augmented reality). But when it comes to business cards, unless you have a special, business-related reason for making your business card different (i.e., you are a professional magician and your business card is embedded with a hologram), a traditional card is best. Ultimately a business card is a tool – it's meant to provide information that you hope will end up in someone's rolodex (or the equivalent). Don't let your desire to make your card different pull you away from the purpose of a business card. 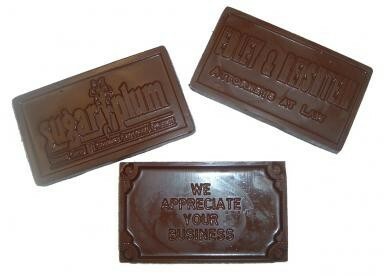 I've heard of people handing out chocolate business cards. Kudos for creativity, but do you think a chocolate card is going in the rolodex? My guess is that it will become a mid-afternoon snack! Cards in various non-traditional sizes are also unlikely to make it into a rolodex – they just don't fit. Do you want to force your new contact to copy your information onto a rolodex card? The one exception to this rule is the folding business card, which is the traditional size when it is folded. I realize that privacy is important, but make sure that your business card contains all the potential ways that a contact might want to try to reach you. Don't limit your contact information to an address and phone number. Include your email address, your IM/Skype handle, your website, and any social media contact information (such as Twitter and Facebook usernames) that a contact might want to use to reach or find out more about you. Use a readable font that is printed in as large a size as you can reasonably fit on the card. Don't make your visual elements so large that you don't have room to add legible text. Your contact may never look at the back of your card – if you must put something there, make it your personal logo, an inspirational quotation, a testimonial or two, or something else appropriate to your profession or industry. For example, if you are a chef, you might be able to put a very simple menu or recipe on the back of a card. Make sure you have new ones with the new information clearly noted. Otherwise, you create the impression that you are someone who tends to procrastinate – even about updating your own business cards! If you are not used to carrying a business card, this may be the biggest obstacle you have to overcome. Get yourself a nice business card case to hold your cards and put it next to your wallet and keys, or in your briefcase or bag, so that you won't forget to bring your cards along to your next networking event, job fair or professional conference. 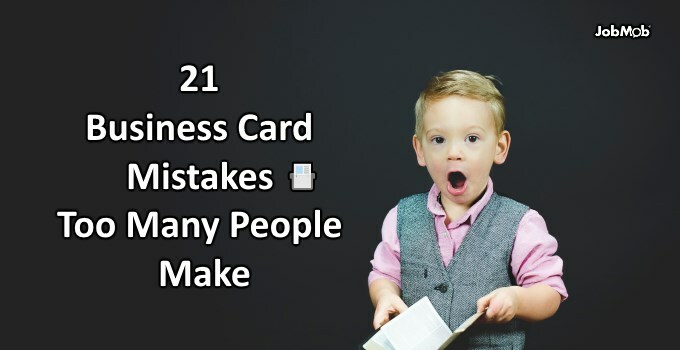 Cards in a wallet tend to get rumpled and smudged, and there is always the chance that you'll drop the contents of your wallet all over the floor while struggling to extricate a business card that got wedged behind your driver's license. That won't make a smooth impression. Be sensitive about when you choose to give out your business card. Of course, do give your card to anyone who asks for it, to anyone who requests your contact information, or to anyone who asks for information about your profession or industry. Equally obviously, don't give out your card at funerals or weddings, meetings with your child's teachers (unless you are specifically asked e.g. by a teacher who wants you to be a volunteer speaker for the class), at doctor's appointments, or in any other potentially uncomfortable situation. You must also be sensitive to the kind of interest that is expressed in social situations – someone who asks you at a party what you do is better responded to conversationally, not by digging out your business card. In fact, as a general rule, don't give out your business card in personal social situations unless you are asked for it, but do feel free to give out your card at professional conferences and networking events. 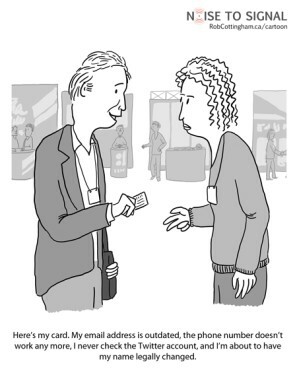 Don't give your card at the beginning of a meeting or event. This is one of those subtle things, but it is important. It gives the impression of arrogance if you toss a card at someone you've just met. If you at least wait to exchange cards until you've spent some time together, it will feel more natural, as if you're giving a new friend a way to reach you rather than trying to make a sales pitch (and while we are on the subject – never, ever, make a sales pitch while handing someone your business card). Handing out business cards is a delicate situation – one that requires a good grasp of the finer points of business etiquette. If you feel totally at sea, don't hesitate to take a class or read a good book on business etiquette to help you to get a feel for it. It's well worth your time to do so. In some cultures, it matters what hand you use to give out business cards – always use your right hand, if you are using just one hand. 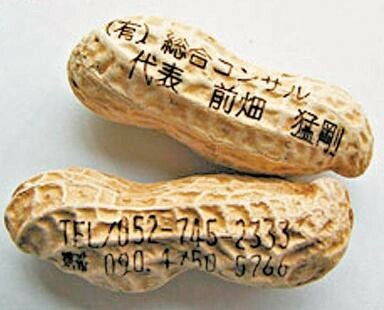 However, in Asian cultures, it is polite to use both hands to present your business card. If you are meeting potential employers or contacts in an international context, look up the guidelines for presenting and receiving business cards in the country where you will be. If you will be spending time in a country where the dominant language is not your own, have your business cards printed double-sided, with one language on one side and one on the other. It is important to not paper the community with your business cards. You are better off handing out cards to a few quality contacts who really plan to get in touch with you again, than giving them out willy-nilly to many people you have just met, who may have no real interest in contacting you again in the future. Yet- if you are in a group of people, and are offering your business card to one person, offer it to the entire group. Otherwise, the other people in the group may feel deliberately excluded. Amazingly enough, many people order business cards, and end up with a professional, beautifully printed card that they keep in their briefcase or on a shelf. What a waste of money – and of a potential marketing tool! No business card is going to end up in a contact's rolodex if you don't hand that card out at every opportunity. If you don't ask for a card from someone who has just asked for yours, you give the impression that you are not as interested in this person as he or she is in you. It will seem as though you are defacing their card. Treat all business cards, including your own, as though they are pieces of gold. If you face a situation where the only paper on which to write is a contact's card or your own, write on the back of one of your own cards. Give close friends and colleagues several of your business cards, which they can then use to refer people to you. Bill Post, Small Business Research Analyst, has been providing research on issues of concern to small businesses for 123Print.com Business Card Design for three years. A former business owner prior to his involvement with 123Print Custom Business Cards, Bill spent several years after receiving his degree in the fast-paced corporate world before going out on his own to provide marketing and branding services to other small businesses in the Washington, DC metro area. 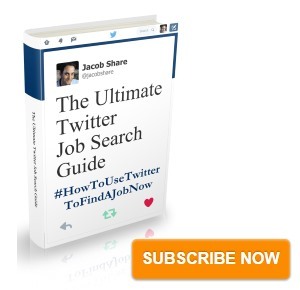 Subscribe to JobMob via RSS or email and follow me on Twitter for the best job search tool insight. I would definitely understand 10, but 20 seems exaggerated to me for many situations. I would figure that if I received a card from someone and I’d like to record some additional information on the spot, it would show that I am more interested as opposed to merely taking the card and perhaps just throwing it out later. josh- I also disagree with #20. When I receive a card, I like to write on the back the event and date it was received at, and maybe even a quick note if it makes sense. I also don’t mind #4, although I don’t have a photo on my own cards. It just depends how it’s done. And what would you suggest for those using on-line/mobile business cards as well? Applications such as http://contxts.com/ and http://businesscard2.com/ allow one to go digital. Personal Pages Smackdown: Which is Best For You? I go to so many networking events that I think I have seen several cases of every one of the above rules; but the most often has to be #10 – Handwritten changes. To add to this tip – it makes you look like your business isn’t doing very well and you cannot afford to get your cards updated and reprinted. As a paid-up member of the Green Party, I am all for reusing things, but there are a few cases where it’s not appropriate and business cards is one of them. Bill, nice post and I have to agree with almost all of your points. 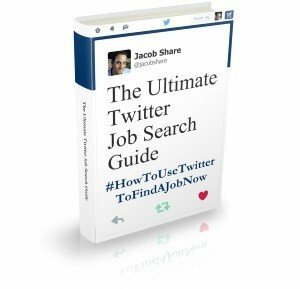 I stopped and re-read #4 about not using a picture and wondered if that is still applicable. On almost every social profile we include a photo, so why not on the business card? Face/name recognition is so important. Just wondering why you think it is smaltzy? I liked the info. My question is how do I present myself after retirement/becoming disabled but still wanting to make contacts. I voluntarily manage a nonprofit resale store and have been asked for my card on several occasions. Being a volunteer, retired or disabled has nothing to do with it, unless e.g. you also specialize in helping the disabled or want to show that you’re open to other volunteering roles. Otherwise, you answered your own question: regardless of whether the nonprofit resale store pays for it or you need to do it yourself, get business cards presenting you as a nonprofit resale store manager. Or, if the nonprofit aspect isn’t important, just as a (resale) store manager. Depends on which kind of impression you’re trying make. I am putting together my card design, and wondering what info I should out on it, without the card being too pull of content. I am a photographer and a writer, and the website will be fine for both. Even the logo has the combination. My logo has my name, so should I write my name as well? Also, the card will have website and contact number and email, but should I include my social media as well? I have an Instagram and Facebook, both used actively. Won’t the card have too much information if I have almost 5 lines on content? Also, my email is Gmail and Hotmail (I have both), as I am not running a business. Which would you suggest to use? If your name is legible in the logo and clearly understood as your name and not e.g. a company name, that could suffice. Only include active social media profiles if their directly relevant (again, non-personal) and no need to use the entire url. For example, for Facebook, just put the f icon and your username or pagename.